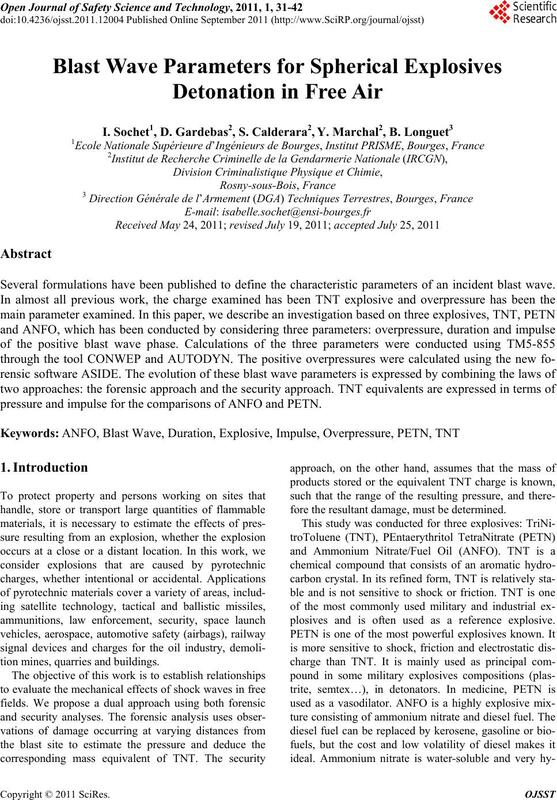 Several formulations have been published to define the characteristic parameters of an incident blast wave. 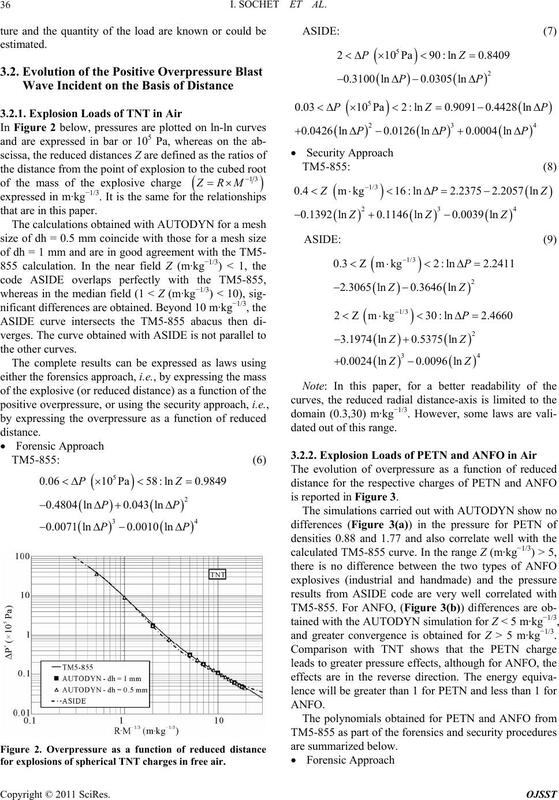 pressure and impulse for the comparisons of ANFO and PETN. tion mines, quarries and buildings. fore the resultant damage, must be determined. plosives and is often used as a reference explosive. atoms in an oxidant and indicates its oxidation potential. oxygen expressed as a percentage (MW (O) × 100%). CO2, and toxic gases such as CO are formed instead. 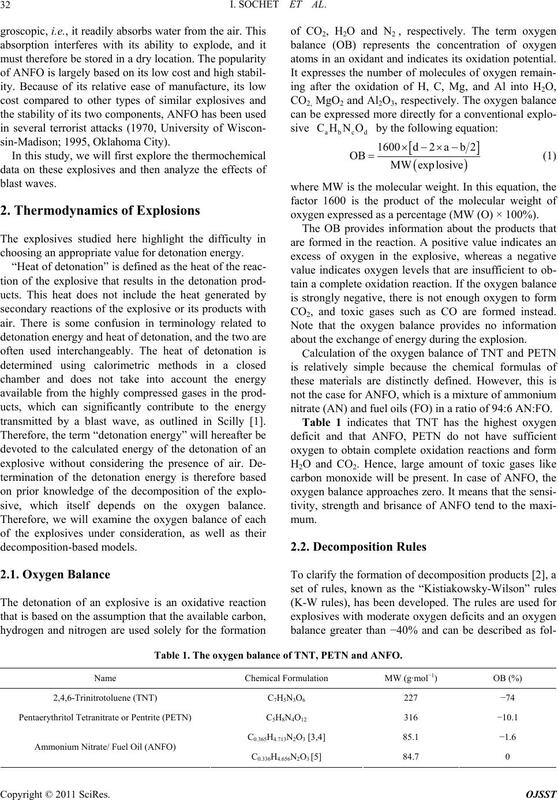 about the exchange of energy during the explosion. 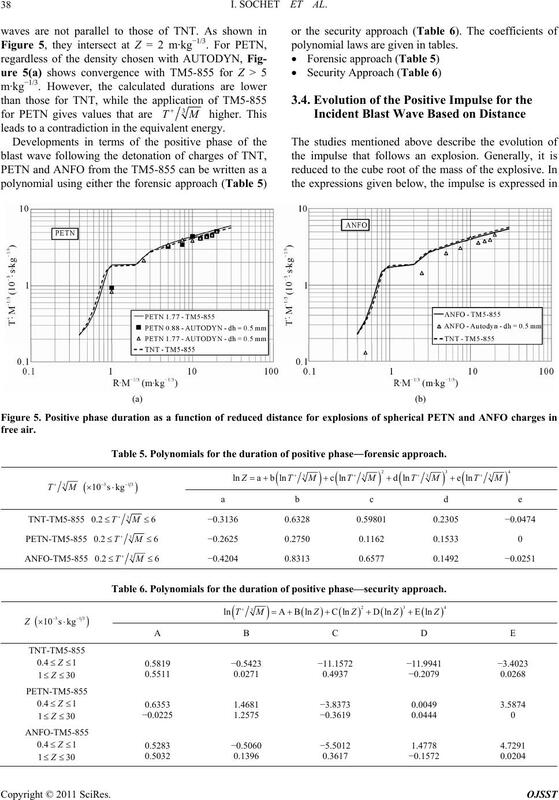 choosing an appropriate value for detonation energy. transmitted by a blast wave, as outlined in Scilly . sive, which itself depends on the oxygen balance. nitrate (AN) and fuel oils (FO) in a ratio of 94:6 AN:FO. Table 1. 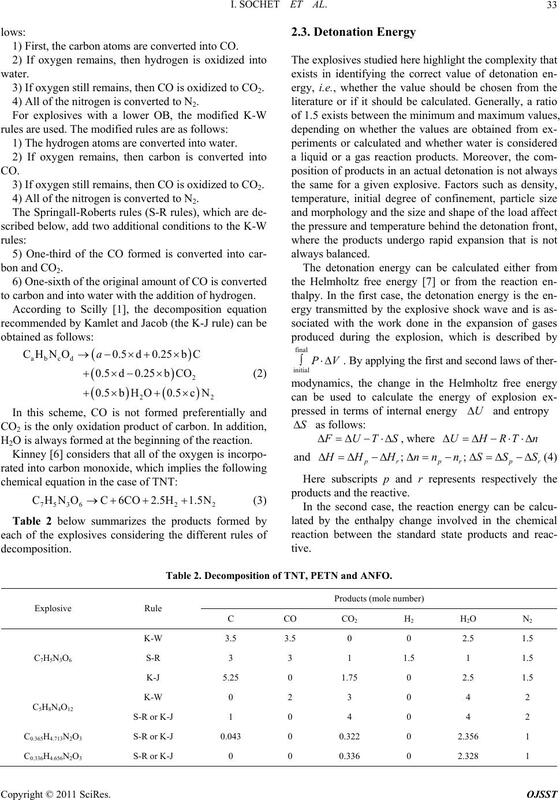 The oxygen balance of TNT, PETN and ANFO. 1) First, the carbon atoms are converted into CO.
3) If oxygen still remains, then CO is oxidized to CO2. 4) All of the nitrogen is converted to N2. 1) The hydrogen atoms are converted into water. to carbon and into water with the addition of hydrogen. H2O is always formed at the beginning of the reaction. Table 2. 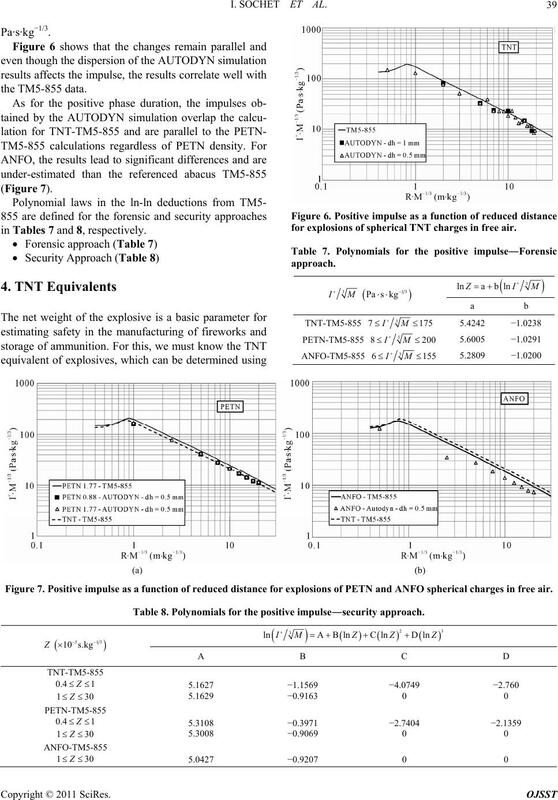 Decomposition of TNT, PETN and ANFO. ported in Table 3 below. in the same energy range for a given decomposition rule. ment for a load of 100 g (−4.535 MJ·kg−1). Omang et al. taking the enthalpy of formation given by Akhavan . the lower and upper bounds. Table 3. 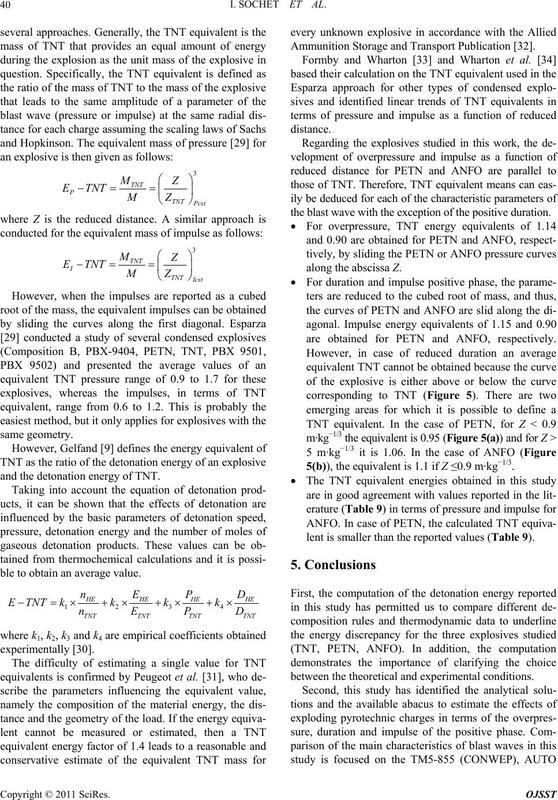 Enthalpy of formation and entropy for TNT and PETN. Table 4. 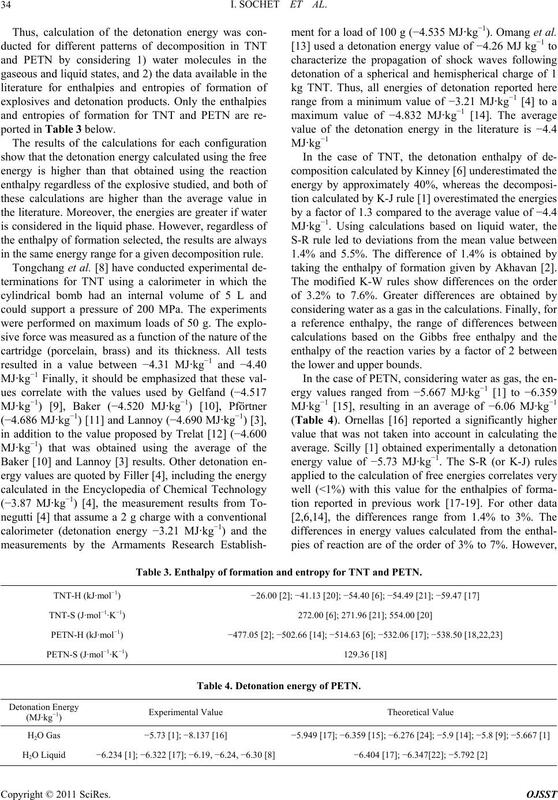 Detonation energy of PETN. 8] or to the average value. correlation with respect to the average value. detonation energy of −5.197 MJ·kg−1. can be schematized by the following profile (Figure 1). 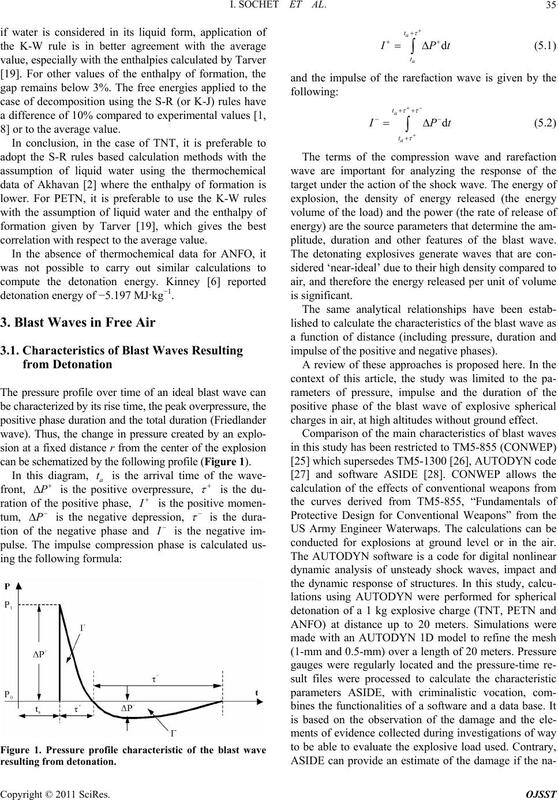 plitude, duration and other features of the blast wave. impulse of the positive and negative phases). charges in air, at high altitudes without ground effect. conducted for explosions at ground level or in the air. that are in this paper. dated out of this range. is reported in Figure 3.
and greater convergence is obtained for Z > 5 m·kg−1/3. Figure 3. Overpressistance in free air. also approaches an asymptote in the far and near field. large gap for short distances less than 3 m·kg−1/3. explosions of spherical TNT charges in free air. leads to a contradiction in the equigy. polynomial laws are given in tables. Table 5. Polynomials for the duration of positive phase―forensic approach. Table 6. Polynomials for the duration of positive phase—security approach. Tables 7 and 8, respectively. for explosions of spherical TNT charges in free air. Figure 7. 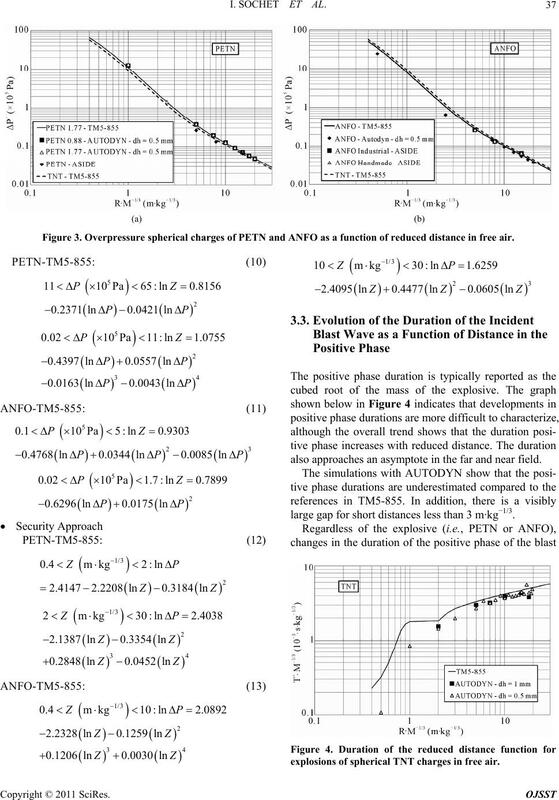 Positive impulse as a function of reduced distance for explosions of PETN and ANFO spherical charges in free air. Table 8. Polynomials for the positive impulse―security approach. Ammunition Storage and Transport Publication . and the detonation energy of TNT. ble to obtain an average value. the blast wave with the exception of the positive duration. are obtained for PETN and ANFO, respectively. 5(b)), the equivalent is 1.1 if Z ≤0.9 m·kg−1/3. lent is smaller than the reported values (Table 9). between the theoretical and experimental conditions. ies obtained in this study. in terms of reduced distance. Process Industries, Vol. 8, No. 5, 1995, pp. 265-273. Royal Society of Chemistry (Great Britain), 2004. Extrapolation de l’Abaque du TM5-1300,” EDF, Dir. sity, New Haven, 1956, pp. 648-657. Air,” 2nd Edition, Springer-Verlag, Berlin, 1985. 2nd Edition, Butterworth Heinemann, Oxford, 1996. No. 6, 1995, pp. 1347-1356.
fice of the US Army, London, 2004. Doctorat, l’Université rléans, Orléans, 2. Waves, Vol. 19, No. 2, 2009, pp. 135-143. Franco-Allemand de Recherche de Saint-Louis, 1993. 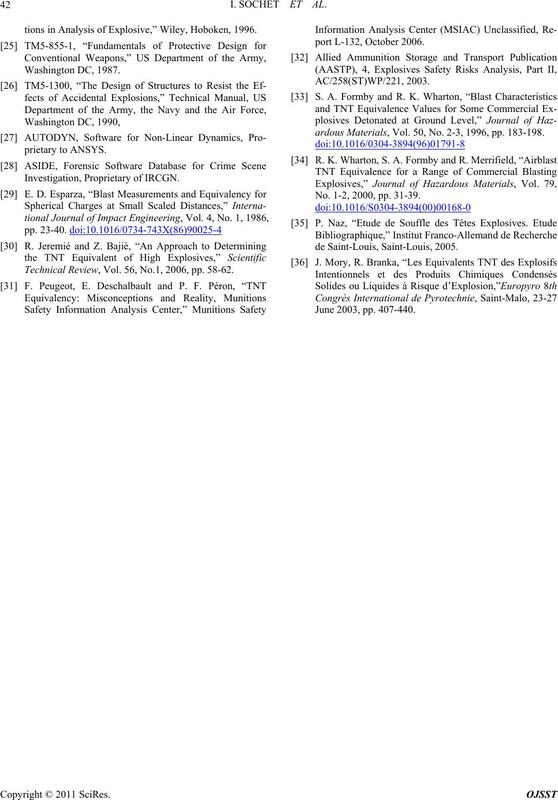 Journal Physical Chemistry, Vol. 72, No. 7, 1968, pp. lants Explosives Pyrotechnics, Vol. 28, No. 4, 2003, pp. and Energy Release Evaluation CHETAH 7.3, 2001. 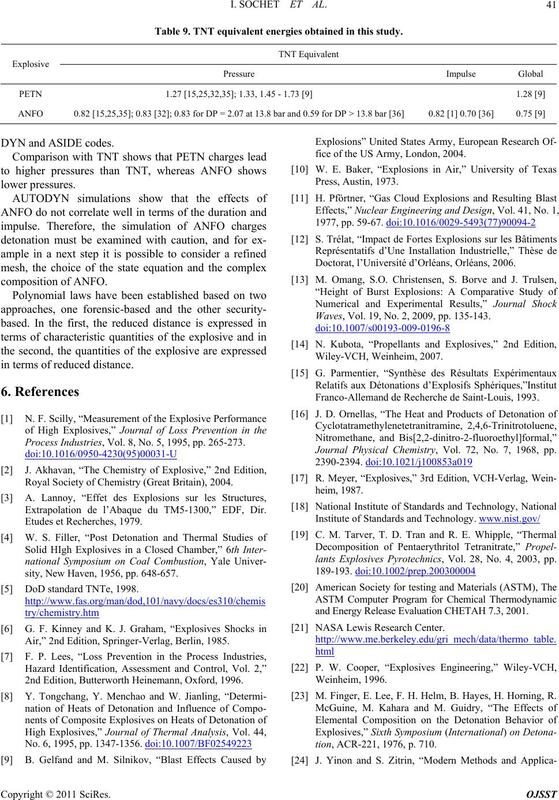 M. Finger, E. Lee, F. H. Helm, B. Hayes, H. Horning, R.
tion, ACR-221, 1976, p. 710.
tions in Analysis of Explosive,” Wiley, Hoboken, 1996. Technical Review, Vol. 56, No.1, 2006, pp. 58-62. No. 1-2, 2000, pp. 31-39.